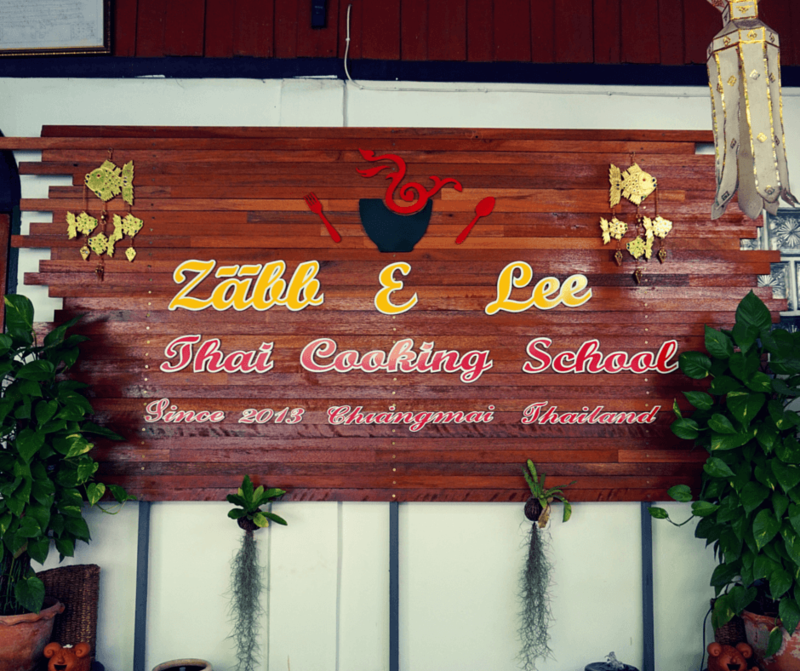 Zabb-E-Lee means “very delicious” in Thai, so it’s no wonder why the best cooking class in Chiang Mai has been named after that phrase. As soon as class started, we knew we’d picked the right one. Anne’s bright smile and outgoing personality were contagious as she introduced herself and told us a little about what we’d be doing over the next few hours. The first thing we did was decide what meals we would be making. There were a lot of options to choose from! So after careful consideration, we all told her which appetizer, soup, stir fried meal, curry paste, and curry meal we wanted to make. Next, we were driven to the Ming Muang Market, a nearby market where Anne gets her ingredients from. She told us about the different vegetables and noodles we’d be using and also let us know some alternate ingredients we could use if we couldn’t find certain items once we got back home. We were also given a few minutes to wander and explore the market on our own. Once we got back, we were separated into groups based on the meal we were about to cook. Ingredients were laid out and we were told how to cut or smash each of them. Once that was done, we moved from the prepping area to the cooking stations. We each had our own station, which was really cool. We cooked, then ate. Then we cooked some more, and ate some more. We were there for 5 amazing hours, learning and absorbing everything Anne said. And she had everything timed very well. When you thought you couldn’t eat another bite, you started cooking again. Once you were done, you realized you could definitely eat more. Especially after getting a whiff of the plate! The five meals we chose were: spring rolls, coconut milk soup, pad thai, khao soy curry paste, and khao soy curry noodles. And there is no doubt that Anne is an amazing teacher because everything I made that day was DELICIOUS!! Oh, and fyi, we are now addicted to Pad Thai! Dessert was also included with dinner. It was a yummy sticky rice with mango that Anne showed us how to make. Hopefully we’ll be able to recreate all of the dishes we made since we were given cookbooks that have detailed instructions and pictures. Anne had us dying laughing the whole time too; she’s pretty hilarious! And she’s an inspiration too. She’s only 28 years old and in only 2 years has created this business that is thriving. She teaches 2 classes a day, every day. She is an incredibly hard worker, and she does it all because she genuinely loves what she does. Her father taught her how to cook at a young age and her passion for food and cooking is obvious. Anne doing what she loves! We really can’t recommend Anne’s class enough; it really was one of the highlights of our trip to Thailand. We all left class feeling happy and very full. It’s definitely the best cooking class in Chiang Mai! – We recommend reserving a spot in class a few weeks in advance since they fill up pretty quickly. You can do so by emailing Anne at [email protected] or by sending her a message to her Facebook page. – If you’d like to be picked up from your hostel/hotel, let her know. If you’re within a certain distance you can be picked up and dropped off after class. – Water, tea, and coffee are complimentary but have cash on you if you’d like to purchase soda or beer. – Let Anne know if you are a vegetarian or vegan; she can make the necessary adjustments. – There are two class times: 9am to 1:30pm and 4:30pm to 9pm. We chose to do the evening class because we figured the weather would be a bit cooler. We’re also glad we chose the evening class because after all that food we just wanted to go straight to bed and go into a mini coma. This is a bucket list item for my next trip to Thailand. On my first trip, I fell in love with the food and Thai food continues to be my most favorite ever. We’ve been to Thailand several times and each time, I fall more in love with their food. If we go back, I would DEFINITELY take a food cooking class because sometimes, I just want a delicious Thai meal at home!!! I find that w/ the right ingredients, most dishes are pretty simple, yet so yummy!! Looks like a great time! Love the fact that you get to custom choose your dishes AND go to the market to go through the entire process from farm to table! We’re always looking for cooking classes to learn to make local cuisine and this looks like a perfect Thai cooking class! It really was awesome to see the process from farm to table. We learned a lot in the class! Sounds like fantastic fun! I love that there was a market experience included in the lesson – way more immersive that way! Now the trick is trying to replicate the amazing food once you get back home 😀 For some reason I always rule at making the food in the class, though can never quite get it right again once I’m home!!! Gorgeous photos! I am about to visit Thailand for the very first time and just learnt my first Thai word – Zabb-E-Lee. Thank you:) Unfortunately, we won’t have a chance to visit Anne in Chaing Mai because we are going to Bangkok and Koh Samui. A cooking class seems like an excellent opportunity to experience local culture and language through food. I am about to search for some market tours/cooking classes in Bangkok! If you can find one, I’d really recommend it. You get to learn so much! I continue to say it. I want to do a cooking class so badly. I eat a lot of Asian food, but I don’t know how to cook many of them. Zabb-E-Lee Thai Cooking Class seems like the ideal thing for me. Also, the fact that she is hilarious will make it even better. You seem to have enjoyed it very much. One of the dishes I want to learn to cook is Pad Thai. This looks like so much fun! I love cooking and I’d like to learn how to make a dish from every country I’ve visited, and those I’ll visit later. I think it’s great that they pick you up and drop you off. You probably won’t find that in too many other countries but Thailand is filled with amazing people so I can see why they go above and beyond. I’m bookmarking this for later! SO i’ve only recently considered cooking classes while travelling but I’m totally hooked on the idea. I was actually looking for one in Chiang Mai so I’ve liked the facebook page and bookmarked this one, thanks so much for the recommendation. She sounds like a really fun person and it’s amazing that she’s created this business in only two years! Beautiful photos of some pretty delicious looking food there! Taking a cooking class in Thailand is definitely a bucket list activity for me. This sounds like so much fun.Love the whole experience of shopping for ingredients before cooking.Have never done this before would love to. The food looks delicious and it is really great when you have a teacher who teaches you with great passion and interest. i think this is a great experience. Wow! What an awesome experience this must have been! 🙂 Love that you all went to the market to pick up the ingredients for your dishes. Everything looks delicious! Next time I’m in Florida, I know where I’m going to eat… Your house! Hahaa! That Thai food looks SO good! I didn’t know Zabb-E Lee meant “very delicious” in Thai! I thought it was named after someone but couldn’t understand the connection between the name of the cooking school and Anne!